Wondering If You Have A Low-Sloped Roof? More than likely, you have a building with a low-sloped roof or a steep-sloped roof. How can you tell the difference? As defined by ASTM Standard E 1918-97, a low-sloped roof has a surface with a slope of 2:12 inches or less and a steep-sloped roof has a slope greater than 2:12 inches. Low sloped roofs are sometimes referred to as a flat roof; however, the pitch on a low-sloped roof is greater than that of a flat roof, which is 0 inches to 2 inches. Low-sloped roofs are designed with some pitch, to allow water to flow off the rooftop into a proper drainage system. A dry rooftop ensures the roof will remain durable and watertight. Ponding of water can increase the likelihood of a leak, and can promote algae, mold, or other plant life to grow, causing damage to the roofs surface. Often times, low-sloped surfaces have one of the following roofing products on them: Roof coating systems, single-ply membranes (EPDM, Hypalon, TPO and PVC), asphalt, built-up-roofs (BUR), modified bitumen or mod bit, spray polyurethane foam (SPF), or metal. A low-sloped roof also has components such as flashings, copings, and drains. Low-sloped roofs can greatly benefit from reflective roofing products by creating a cooler indoor ambient air temperature, lowering energy utility bills and lengthening the lifespan of the roof. The easiest and most cost effective of these products to install would be a Cool Roof Coating System because it can be installed directly onto the existing roof membrane without needing to tear-off the existing roof. Cool Roof Systems also do not require businesses to close during installation as they are non-disruptive. For additional information on roof coating systems, reflectivity and Cool Roof Coatings, download our FREE Product Brochure. Fully Restored, Seamless, Weatherproofing System - Roof Coating Systems are monolithic membranes that are spray applied across your roof, around pipes, hatches, and other equipment found on the roof top to fully seal and waterproof your roof. When sprayed, the coating melts together if you will, so there are no seams, or patches around those hard to seal and reach areas. Cost Effective – Roof coatings are applied directly on top of your existing roof, speeding up installation time and reducing costs, as the systems are not as labor intensive as the installation of a new roof. A roof restoration system does not require the existing roof to be torn off, eliminating the contribution of landfill waste and costing you less, as you do not need to pay landfill fees. Sustainable - These systems are renewable and can be re-coated every 10+ years to lengthen the roof-life, renew the reflectivity, and ensure excellent waterproofing capabilities. Environmentally Friendly – Restoring your existing roof and reusing the current materials drastically reduces landfill waste and improves the environment. Many of our coating contain ultra low or zero VOC’s and can qualify for the US Green Building Council’s LEED program for Sustainable Sites, Energy and Atmosphere, and Materials and Resources. No Major Disruptions to The Work Environment During Installation – A huge cost advantage to both the AcryPly and ARM systems are they do not require a business to close during installation. The systems create minimal noise and have low odor (often zero VOC’s), allowing you to conduct business as usual with less disruption to the occupants inside the building. Installing a new roof can take upward of a few weeks, costing business owners a great amount of revenue loss while their business is closed during the installation process. Restoring your low-slope, commercial roof is far cheaper, quicker, and is much less disruptive to your buildings’ occupants than completing a traditional roof tear-off and new roof install. 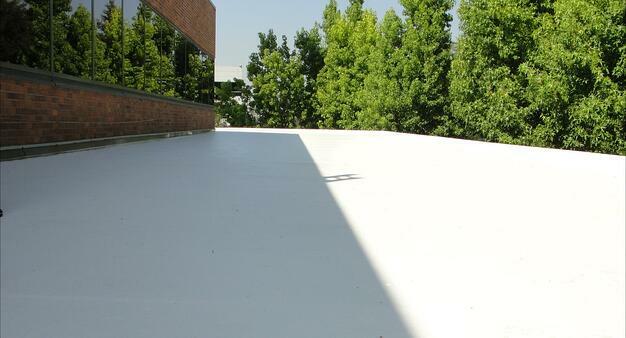 Reflectivity - Highly reflective top coats provide excellent UV protection to your rooftop. This additional protection adds years to your roof and reduces roof maintenance costs. Highly reflective roof coatings also deliver a cooler and more comfortable environment inside the building with less air conditioning usage, ultimately lowering your energy utility costs. For more information and benefits on roof coating systems, download our FREE Roof Coating Product Brochure. There is no easier way to waterproof your commercial roof than spray applying a monolithic membrane on top of your existing, failing roof. AcryShield roof coating systems are installed in a few simple steps: a layer of AcryShield base coat with polyester reinforcing fabric embedded into the base coat if necessary, and lastly a layer of AcryShield top coat. These systems are applied over a wide range of roofing membranes to give your existing roof superior waterproofing, industry leading UV protection, dirt pick-up resistance, tenacious adhesion and resistance to ponded water. 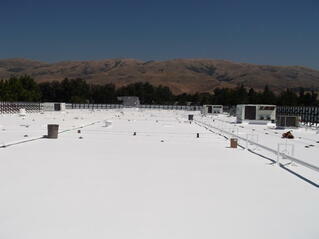 Applying an AcryShield roof coating systems over your existing roof eliminates a costly and timely roof tear-off. These systems are spray applied, removing any need for patching and sealing areas around HVAC equipment, pipes, skylights, etc… These systems are sprayed around those hard to reach and hard to seal areas to create a seamless system for excellent waterproofing. No business closure during installation. Throughout installation, there are minimal noise disruptions because there is no drilling, nailing or seam welding during application. The roof coatings used in these systems contain low or even ZERO VOC’s, with no harmful or strong odors, allowing you to keep your business open. The AcryShield A502 basecoat eliminates the need for traditional primers or etching rinses to be applied and captured before the base coat can be applied on top of EPDM, Hypalon or TPO. This allows contractors to eliminate installation stages and building owners to save money. Installation time is fast with minimal steps and can even be quicker when using the AcryShield Quick-Set base and top coats. These Quick-Set products are formulated to set rapidly in order to resist early wash-off associated with heavy dew and light rain. Learn more about roof coatings - download Considering Coatings? A Free Guide to Roof Coatings.